HOW ARE YOUR CARVING CONTEST ENTRIES COMING? - What About Watermelon? 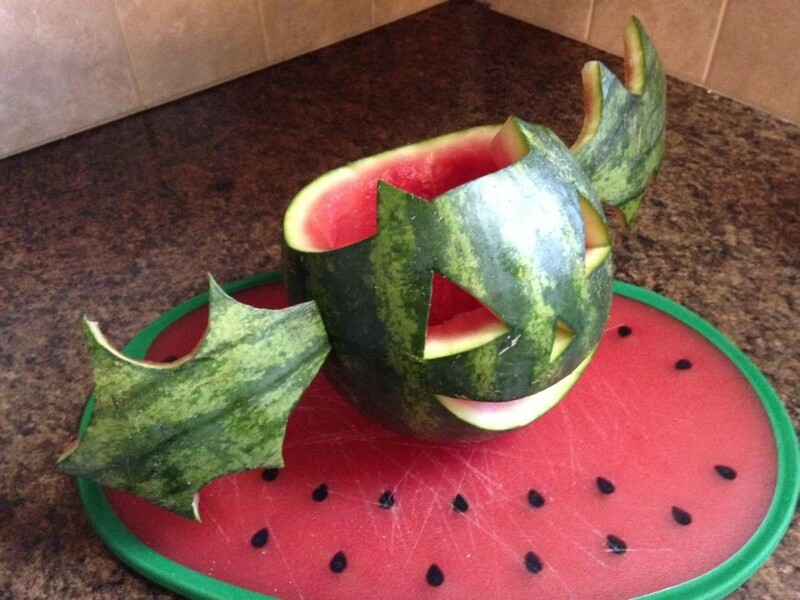 You are here: Home / Watermelon Carving / HOW ARE YOUR CARVING CONTEST ENTRIES COMING? HOW ARE YOUR CARVING CONTEST ENTRIES COMING? With the 2015 Watermelon Carving Contest drawing to a close (enter your carving here before August 3, at 11: p.m.), I thought it would be a good time to take a look back at some of my own carvings from the past 12 months. When I scoured the What About Watermelon archives to see which carvings I had created between August 2014 and today, I was shocked to discover that my creations totaled only two. TWO! The bat and Stegosaurus you see below represent the body of my work during that period, which made me realize that I need to carve more often. With that in mind, I’m currently accepting suggestions for what I should carve in August and September. If you’ve got any ideas, leave a comment! I carved this bat “jack-o-melon” in October of last year as an alternative to the usual Halloween pumpkin carving. It was a relatively simple carving, with the only difficulties being the wings. They were hard to carve to make sure they were exactly the same size and shape (I’m a stickler for that type of stuff), and they weren’t easy to affix to the side of the bat. The toothpicks weren’t quite doing their job, but it all finally worked out. My first carving of the 2015 season was the deliciously terrifying Stegosaurus you see above. On a simplicity scale, this one was only about a two. The body was super simple to make. The only real challenge was carving the head and tail, which weren’t all that hard to do. Remember: All comments left on the blog this month are entered to win our THREE weekly National Watermelon Month July prizes, so comment as often as you’d like! 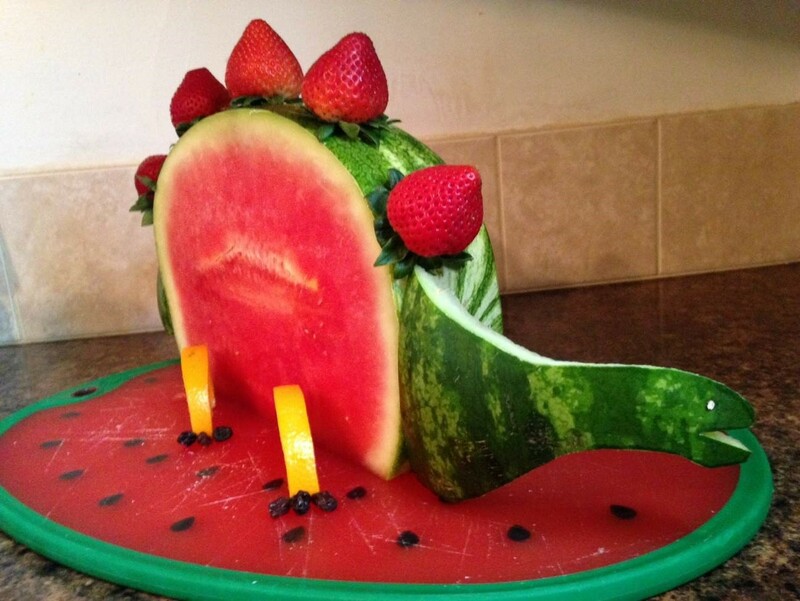 Don’t forget to enter our 2015 Watermelon Carving Contest! We still need plenty of entries in the “Beginner” category, so all you new carvers should definitely enter for a chance to win. The deadline for entries is 11:59 PM on August 3. There are $4,000 in prizes and the first 25 entrants will receive a Dexas watermelon cutting board. Check out the official contest web page for categories, judging criteria and how to enter!